I know that it’s technically spring, but the weather here seems to have missed the memo. I was hoping that the light snow called for in this morning’s forecast was just an April fool’s joke, but, alas, it was for real. Rhubarb and ramps have gotta be just around the corner, though, so I’m going to take these (hopefully) final chilly days to squeeze in some of the heavier desserts I won’t be in the mood for soon. Things like this dense, rich Chocolate-Cherry Torte. 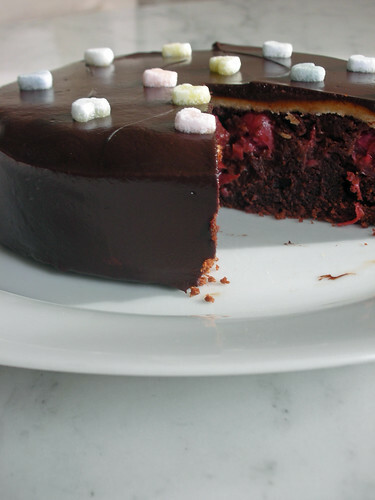 I think this was my husband’s dream cake….chocolate, almonds and cherries…all his favorite things together in one. I loved the fudgy texture of the cake itself, and, of course, the chocolate ganache glaze. The thin layer of marzipan in between the cake and glaze was a nice flavor touch. This isn’t a difficult cake (in fact, you can make the batter in the food processor), but there are a few steps from start to finish. A fun project for a chilly day spent inside! Steph’s Note: You can use semisweet or bittersweet chocolate, depending on how sweet you’d like the cake to be. I found jarred Morello cherries at Trader Joe’s. I used marzipan in lieu of almond paste here. -Preheat oven to 350°F; put rack in center of oven. Butter a 9″ or 10″ springform pan. Add the breadcrumbs and shake pan to coat bottom and sides. Shake out the excess. Drain cherries well and set aside. -Melt chocolate in double boiler over barely simmering water, stirring occasionally. -Put the butter and sugar into a mixer or food processor and blend until light and creamy. Add one egg and mix well. Then add second egg and mix well. Add the extracts. Add the melted chocolate and mix gently or process in a few quick pulses. Mix in the almonds and the flour, and finally, the remaining egg. -Pour and scrape the batter into prepared pan. Smooth top with a spatula. Arrange cherries in close concentric circles on top (the entire surface should be covered) and press them gently into batter so just the tops are showing. If the surface is uneven, smooth it out with a wet spatula. There may be a few cherries leftover. -Bake for 50 minutes to one hour. Don’t overbake. The cake may look dry on top, but will be moist inside. Remove from pan and cool completely on rack. -Put a length of waxed paper on flat surface and sprinkle with confectioner’s’ sugar. Work the almond paste into a flat round and turn it in the sugar. Cover with the second sheet of waxed paper and roll out into a circle the diameter of the cake. It should be quite thin (about 1/16th”). Take off top layer of waxed paper. -Using the cake pan as a guide, cut out a circle that will fit the top of the cake exactly. Save extra pieces to patch any torn part or use for decorations. Cover the cake with the almond-paste round. -To make the glaze, bring cream and coffee to a slow boil in heavy sauce pan. Take it off the heat and add the chocolate; stir gently until the chocolate is melted with no lumps (you can strain it if lumpy). Let the glaze cool briefly, until spreadable. Thin it with 1-2 t hot water if it’s too thick. -Place cake on a rack over a sheet of waxed paper to catch drippings. Pour a thin layer chocolate glaze over the cake spreading it with a spatula. It should cover the top and sides of cake. Chill the cake briefly and and a second coat. Decorate if you wish (you can make roses or cut-outs from any almond paste scraps). -This cake will keep unrefrigerated in a cool place for 2 days. It can be refrigerated, but the glaze will lose shine. Please note that the publisher, W.W. Norton, sent me a copy of this book…but I would have bought it anyway! This looks so decadent! 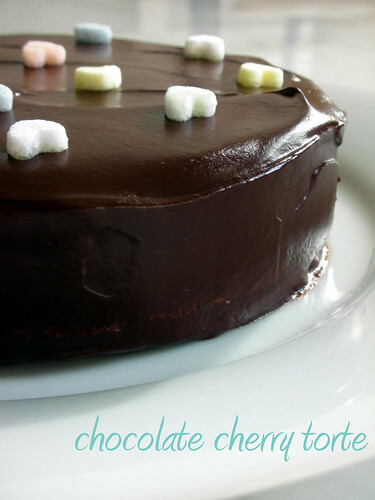 I love the color of the cherries within the chocolate cake! Nothing like any kind of chocolate cake for warming the heart, if not the body! This is an unusual flavour combination I don’t think I’ve seen before and it looks really lovely – great photo! This cake looks amazing! Marzipan and chocolate are delicious together, so I can only imagine the ensuing magic that occurs when cherries and almonds are added to the mix. What a delicious recipe! Chocolate & cherries on a snowy spring day is definitely a comfort food. Looking forward to this torte. Stunning! I am sure that Lora, Craig & Pierre could never have imagined how gorgeous this torte could be. Beautifully done! Love that book–a true treasure! This looks divine! I have a weakness for sour cherries and almond paste. Oh wow this combination sounds amazing. Dark cherries and chocolate are always good, but throw in some almond flavor in there? I’m sold.